Q. HOW DOES CHINESE ACUPUNCTURE WORK? Q. WHAT IS THE DIFFERENCE BETWEEN CHINESE ACUPUNCTURE AND PAIN MEDICATIONS? Q. IS CHINESE ACUPUNCTURE ONLY A PLACEBO? WHAT IF I DON’T BELIEVE IN ACUPUNCTURE? Q. IS CHINESE ACUPUNCTURE SAFE? Q. DOES CHINESE ACUPUNCTURE HURT? Q. WHAT TO EXPECT FROM A TREATMENT? Q. HOW MANY CHINESE ACUPUNCTURE TREATMENTS ARE NECESSARY? Q. DOES MY MEDICAL INSURANCE COVER CHINESE ACUPUNCTURE TREATMENTS? Chinese Acupuncture treats diseases by painlessly inserting thin, sterile needles into certain designated points in the body, and inducing stimulation through various manipulative methods. Sometimes, an electronic apparatus may be used to maintain a constant stimulation. During treatment, the patient may lie comfortably on the table, or sit quietly in a chair for twenty to thirty minutes. The general theory of acupuncture is based on the premise that there are patterns of energy flow (called “Qi”, pronounce chee) that are essential for health. According to the established doctrines of classical Chinese medicine, this is an unceasing flow of life energy throughout the human body to maintain life and health. This vital energy originates from the major organs, and flows along the continuous circulatory channels called Meridians. When the energy flow is smooth and in balance, one is healthy; if the balances disturbed, then one will experience illness or pain. There are some specific points along the meridians called acupuncture points where the energy flow can be stimulated and the function of related organs could be regulated, thus restoring the delicate balance. These effects are vital for the healing. Acupuncture is applied to the points selected on the basis of meridian systems. This is the Chinese way to explain how acupuncture normalizes the physiological function and helps to maintain the body’s harmonious equilibrium. In other words, acupuncture amplifies human’s natural healing power. For thousands of years, Chinese physicians not only use acupuncture to treat diseases, but also to strengthen the human body’s physical condition, to prevent disease, to promote health, and to achieve longevity. WHAT IS THE DIFFERENCE BETWEEN CHINESE ACUPUNCTURE AND PAIN MEDICATIONS? Typical pain killers, or Non-steroidal anti inflammatory drugs (NSAIDs) have several well-known potential damaging effects to your system such as gastric irritation and liver damage, while acupuncture has virtually no side-effects. In terms of the action on your muscle and joint pain, acupuncture works in a completely different manner from medications. Most pain-relief and anti-inflammatory medications provide short-term pain-relief by blocking the production of pain-causing substances called prostaglandins. In addition to inducing pain, however, prostaglandins are vasodilators which help enhance circulation. By inhibiting the production of prostaglandins, there will be decreased sensitivity to pain but blood supply to the muscles and joints will also be decreased, thus creating problems and prolonging true recovery. Acupuncture, on the other hand, produces the complete opposite effect. Except in a few very acute cases, we attempt to enhance blood circulation, especially in the area that there is pain or discomfort. This desired action can be achieved by regulating the autonomic nervous system (which is responsible for internal organ system functioning, regulation of blood circulation, and production of relaxation effects) using specific acupuncture techniques. When circulation in the tissue improves, muscle relaxation occurs and immediate pain reduction follows in many cases. In some other cases, however, when circulation improves, the pain in the affected area occasionally intensifies, and is then followed by repair of tissue and muscle relaxation. IS CHINESE ACUPUNCTURE ONLY A PLACEBO? WHAT IF I DON’T BELIEVE IN ACUPUNCTURE? The idea that acupuncture only works as a placebo is one of the biggest misconceptions about acupuncture. Fortunately, you don’t need to believe in acupuncture for it to help you. Studies have shown acupuncture to be very effective in treating a number of conditions in humans, as well as animals such as horses, dogs, and cats. Animals are incapable of actually “believing” in acupuncture, yet it still works very well for them. 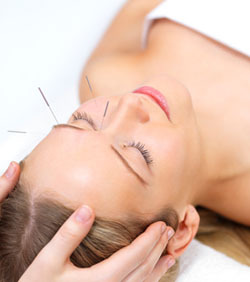 The primary advantage of acupuncture is its safety. According to Journal of American Medical Association, “In the hands of competent physicians, acupuncture is a method free from discomfort or side effects . . . “ The U.S. Food and Drug Administration (FDA) approved acupuncture needles for use by licensed practitioners in 1996. The FDA requires that sterile, nontoxic needles be used and that they be labeled for single use by qualified practitioners only. Very, very, few complications from the use of acupuncture have been reported to the FDA in light of the millions of people treated each year and the number of acupuncture needles used. The short answer is “No”. Two factors play the biggest role when it comes to patient discomfort. The first is the needle. At ACM Health Center, we use the thinnest needle available on the market. They are thinner than human hair and much, much smaller than needles typically used to draw blood or give injections. The second and more important factor is the doctor’s technique. All of our physicians have years of training and practice using thinnest available needles. We have many pediatric patients who receive acupuncture treatments with no problems at all. Most patients find the treatment very relaxing, which brings on a feeling of well being. As a sign of “obtaining the vital energy”, some patients may have a slight sensation of characteristic tingling, numbness, ache, traveling warmth, and/or heaviness around the needles. The beneficial reaction usually starts during the first four or five visits. Of course, just like any other medical treatment, not all cases can be cured. However, there is no harmful effect from the therapy in common practice. Therefore, people who suffer from lingering or chronic diseases, which do not respond well to orthodox medicine, are particularly encouraged to try this promising Chinese art of healing. HOW MANY CHINESE ACUPUNCTURE TREATMENTS ARE NECESSARY? Each person is unique; therefore, the treatment plan is individualized. It depends on the type of the illness, the severity of the condition, the duration of the sickness as well as the physical state of the patient at time of treatment. As a classical tradition, a course of treatment usually takes twelve sessions, more or less. In order to get the best therapeutic result; acute cases should be treated daily for a few days, then in longer intervals. Chronic cases usually need two or three visits per week. In case of slow reaction, the patient should still try to complete the entire course; some time even a second or third series, because most of these cases require more effort to restore energy balance. To receive the best results, treatments should not be missed. DOES MY MEDICAL INSURANCE COVER CHINESE ACUPUNCTURE TREATMENTS? It depends on your insurance company and the type of coverage you have. An increasing number of insurance providers cover all or part of the cost of acupuncture treatments, but these providers may have restrictions on the types of illnesses they cover, the number visits covered, the amount of deductible and co-pay. It is best to call your insurance company’s 800 number to see what your policy offers.